Anthony Weiner and his wife, Huma Abedin, have opened up to the New York Times Magazine about the Great Crotch-Shot Scandal of 2011 and how they overcame it. The story is part of an image-rehabilitation effort for Weiner as he contemplates a mayoral run later this year. But, instead of convincing us that a mellowed, remorseful Weiner should run for mayor, it made a compelling case for Abedin, Hillary Clinton’s worldly right-hand woman. 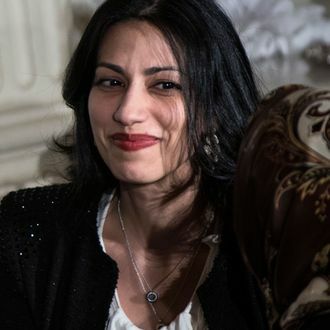 Two days later, Abedin boarded Clinton’s plane for a weeklong trip to Africa, with a stop in the United Arab Emirates. “My compass was my job,” she says. “I’ve never been on Twitter,” Abedin says. As an added bonus, New York would have a close personal friend in the White House once Hillary Clinton becomes president. As for Weiner, he’d make a fine Crossfire host.